Love! 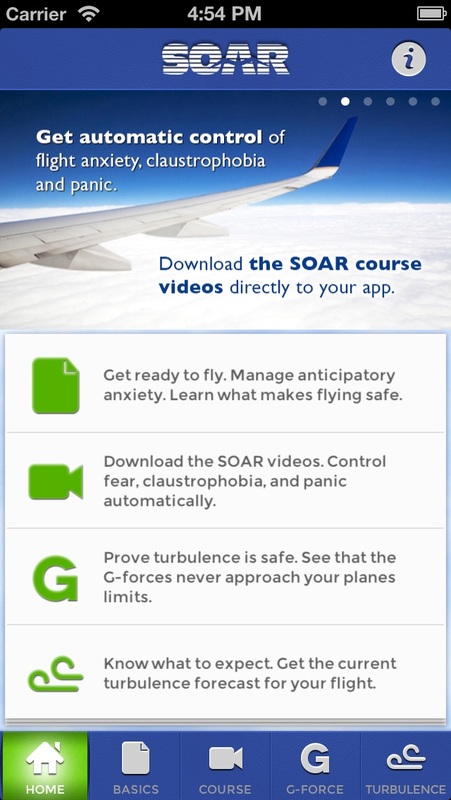 - autor:Yam24e - title:Won't fly without this app! I was able to fly to San Francisco applying all my "tools." The flight there was smooth and that really was not fair in stating it all worked. However, the flight back to Houston was very turbulent and I applied all my tools and consistently looked at my G-force tool which calmed my nerves immensely. Thank you again. - autor:BW Houston - title:Thank you for this fabulous APP!!!! This program has been a life saver!! I missed out on so much before this program but never will again! The app is icing on the cake! - autor:Magpiemk - title:SOAR is the best!! !